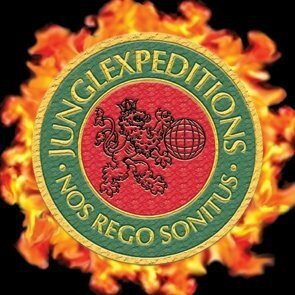 JungleXpeditions is a world wide distributor of DRUM N BASS that is based out of Montreal, Canada. They focus on music that hovers between JUNGLE and BREAKCORE, with lots of emphasis on oldschooly breaks. On their various labels, you’ll find jams that are innovative, and boundary pushing, while always paying tribute to the roots of Rave music. For all of the above reasons, these guys WIN BIG TIME! Here’s a stellar example of the kind of stuff you’ll find coming out of the JungleXpeditions hub. It’s on a Kansas City RAGGA JUNGLE label, called WARLORD-DUBPLATES, and is a collaboration between two renowned veteran American Jungle producers, DIRECT FEED and SIXFOOTUNDA. Heads will recognize the classic samples, and enjoy the blistering fast speed and erratic break chopping. Blam! What a choooon. The JungleXpeditions roster is filled with more stuff like this, SOOOOO, if you’re down, like them on FACEBOOK, then get at their WEBSITE and peep some more madness. Never blogged about a distribution label before. Another first for DEAD KIDS!